Thank you so much to Allen & Unwin Australia for sending me a copy of Before the Devil Breaks You by Libba Bray. All thoughts are my own and receiving a copy of the book in no way impacted my feelings or opinions. With terrible accounts of murder and possession flooding in from all over, and New York City on the verge of panic, the Diviners must band together and brave the sinister ghosts invading the asylum, a fight that will bring them face-to-face with the King of Crows. But as the explosive secrets of the past come to light, loyalties and friendships will be tested, love will hang in the balance, and the Diviners will question all that they’ve ever known. All the while, malevolent forces gather from every corner in a battle for the very soul of a nation–a fight that could claim the Diviners themselves. Audiobooks give me a reason to walk my dog and it’s honestly nice. I listened to the entirety of Before The Devil Breaks You by Libba Bray on audiobook and I think it added to my overall experience. Especially since I was walking 50-60 minutes a day listening to the book on 2x speed. I went into Before The Devil Breaks You knowing I’d love it. I knew going in that this story was going to be just as amazing as the others in the series. It was going to be a story that left me itching to walk my dog. Libba Bray is an incredible storyteller. The way she weaves a story is absolutely spectacular and like nothing else I have read before. It is truly something that sits with you and makes you desperate for more. I am truly not a character-driven reader, something I think I’ve said in every review for these books, but Libba Bray makes me a character-driven reader. I care so deeply for each of these characters and reading about them had me genuinely crying while I listened – thank God I walk up a deserted road that means no one sees me. This story is truly written about the ‘outcasts’ of this society and it is just so beautifully done with endless layers throughout that I don’t know why more people aren’t hyping it up. If you want to read more about this topic I recommend checking out Elise’s review, click here! Before The Devil Breaks You follows our cast from the previous books. Theta, Evie, Sam, Jericho, Mabel Rose, Ling, Isaiah, Memphis, and Henry. The group are a bit of an interesting one but they truly do come together. Their voices all shine through the story and Libba Bray manages to capture it all. Hell is basically coming down on New York. Ghosts are coming out of the woodwork and now the diviners are known it seems it be happening at a rapid rate. The characters face a new enemy, the one who is the reasons behind all the problems they have faced in the previous books. The group undergoes their own personal struggles though, trying to find their identities and struggling with the past coming back to haunt them. I really don’t want to say too much because I feel it is best to go into these stories not expecting anything. It is truly best to be surprised and excited by each twist and turn this plot takes. I think my favourite thing about this book was the focus on Theta. Theta has quickly become my favourite character in The Diviners series, and it really is because of her background involving domestic violence. Her whole backstory is so realistic to me, and something that makes me stop every time it is mentioned. With someone from her past returning to this book, Theta was really a shining star in this book. Seeing her growth, her love and her kindness were beautiful. Even seeing her blooming relationship with Memphis and Isaiah was lovely – especially since Isaiah wasn’t Theta’s biggest fan. My whole life is dedicated to this little trio though. Theta is just such a strong woman and I absolutely love seeing her relationships. Isaiah and Memphis are just Goddamn sweethearts and if they aren’t protected in the final book I will throw my phone. A character I surprisingly grew to love throughout Before The Devil Breaks You was Mabel Rose. We know Mabel Rose as Evie’s best friend in previous books. As Evie took the backseat in this story, as there are so many stories to highlight, Mabel Rose stepped further back into the shadows. Her shining character feature was the fact she was in love with Jericho – which was a bit a bore. As Mabel Rose discovered her identity throughout Before The Devil Breaks You I was shocked to find myself crying for her. This particular storyline added something new to these books and was beautifully done. Libba Bray just adds more and more layers. Ling also confirms that she is both interested in women (not men) and does not feel sexual attraction. She never labels herself asexual because obviously she does not know the word, but there was a really interesting discussion. Basically, I love Ling. I would die for her. Evie had some incredible character development too. The development comes primarily towards the end of the book and it really sets itself up for the final book in the series, which will be incredibly interesting I can already tell. To pair up me talking about character development I should also mention that Sam also had some amazing developments. We got to learn extra layers of the boy and it was honestly nice. How many times can I say nice? Sam wouldn’t like that description. I guess I should mention the thing I didn’t enjoy about this book. It has been mentioned in almost every review so I’ll try not to touch on it too much. There is a scene with Jericho that involves attempted sexual assault. It is incredibly graphic and we see it from the eyes of Jericho. The scene itself is used to make Jericho the enemy and push Evie closer to Sam, which is obvious. It is also never brought up again. It is simply forgotten and all is well. It was as if it was writing Jericho completely out of the story. The scene just felt like it was done in extremely poor taste, which wasn’t nice. I also didn’t enjoy the fact that Henry took a bit of a backseat in Before The Devil Breaks You – I understand that it’s because he had a main role in the second book but I really do love him! 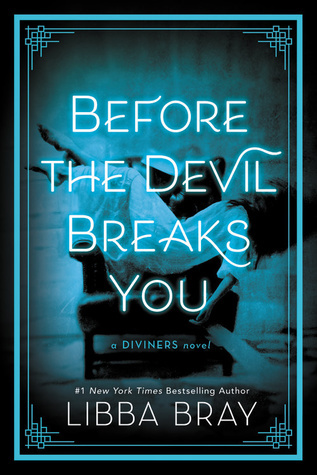 Overall, Before The Devil Breaks You by Libba Bray has to be my favourite in the series. These stories are absolutely heartbreaking and make me yearn for more. Libba Bray is extraordinarily talented and if you haven’t picked up this series I highly recommend you do. You will not regret your choice. The Diviners series is next level and it deserves more hype.